Early career researchers, including advanced PhD students working on creative economy topics, are invited to register for an Early Career Research Camp organised by CREATe. The event will take place over the 4th and 5th May in Glasgow at the Centre for Contemporary Arts. The programme includes interactive activities and expert roundtables covering interdisciplinary work, new research methods, engagement with policy and societal impact. Over the course of the two-day event, teams will develop a research proposal on a creative economy theme, with a £1000 prize for the winning proposal. The event is supported by the Arts and Humanities Research Council.Registration is free, but space is limited to 45 participants. To apply, please send a short CV and 200-word summary of your research interests to the lead organiser Dr. Kristofer Erickson no later than Friday, 24th March. 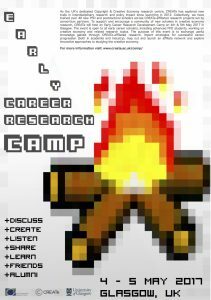 For more information about the Early Career Research Camp, including programme and list of confirmed speakers, please see the main resource page here.